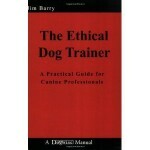 SUMMARY: Ethical toolkit for dog trainers including a well-written review of the usual hot-button issues. AUDIENCE: Jargon-free, short, and smoothly written: no background in philosophy required. Will benefit professional dog trainers will benefit most. It will help them tackle the ethical challenges of our profession. REVIEW: The Ethical Dog Trainer is, as far as I am concerned, an absolute must-read for professional dog trainers. Jim Barry is one of the US’ most highly regarded gun dog trainer, and somewhat of a pioneer in the field with his force-free approach. In his previous life, he was a university professor (philosophy). In the book, Jim Barry summarizes the controversial issues in the dog world today in a lucid and balanced way, tackling the usual hot button issues. The book gives the reader a toolkit to help them take a moral decision in situations involving e-collars, euthanasia, re-homing, public danger, etc. His professional and academic credentials place him at the crossroads of philosophy and dog training, making him eminently qualified to author an academically rigorous but real-life relevant book on the ethics of dog training. The book also had an unintended effect for me: it reminded me of how noble dog training can be, requiring so much integrity, tact and empathy for us to be effective at what we do. And, a real treat to logics nerds like me, the book contains a list of commonly recurring fallacies (ad hominem, red herring, etc.) and their relevance to the dog training world. Browse the Book Review archive. Genre: professional manual. Author: Barry Jim. Reading Level: Professional. Star: 5. Bookmark the permalink. Post a comment or leave a trackback: Trackback URL.